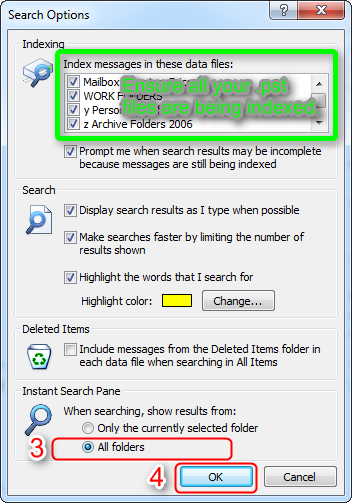 Microsoft Outlook 2007 has a very good built-in indexed search utility that can search across multiple .pst files (personal folders and archives) at the same time. You can find it in the upper right corner of your Outlook window. Surprisingly, it eliminates the need for 3rd party indexed search tools like Lookeen, and the older Lookout (both of which I've used). It is also better than Google Desktop and Lookeen because you can view the actual emails natively in Outlook, and easily re-file mails directly by dragging and dropping them into a new folder. There was just one annoyance, but luckily I found a solution. With the default settings, it only searches the folder you're currently in. Searching one folder at a time is never enough for me. To get it to search across all folders I had to scroll way down to the bottom of the search results, and click a link that said, "Try searching again in All Mail Items." It would then return the results I originally wanted, but wow, what a time waster to have to search, scroll, and click each time I needed to find something. 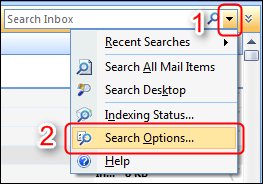 Now you'll notice that back on your main Outlook page, your little search box now says "Search All Mail Items" instead of just "Search Inbox." Whatever you type into the box will automatically return ALL results from ALL your emails from ALL your .pst files (assuming you have them all selected to be indexed; see the green box in the pic above). YAY!